CHARLOTTE, N.C. –- 26 APRIL 2018 –- Ventura Air Services has committed to secure a supplemental type certificate (STC) from the Federal Aviation Administration (FAA) for the installation and operation of a SmartSky 4G LTE system on the Bombardier Learjet 55. There are more than 100 Learjet 55s currently in service in the United States. The aircraft holds up to 8 passengers and two crew. The Learjet 55 is the primary aircraft operated by Ventura Air. This growing New York-based charter management company uses both private jets and helicopters to offer 24/7 first-class transportation solutions. The company dates back to 1955 and enjoys an impeccable safety record. The SmartSky 4G LTE system received its first STC in January and parts manufacturer approval (PMA) in March. It expects additional STCs to begin to be available this summer. Network implementation efforts currently underway across the continental United States are continuing to expand. More than 60% of the sites needed to provide U.S. coverage are now in their final stages of deployment. Ventura is led by the Tarascio family. Founder Mike Tarascio flies and fixes jet equipment, Maureen Tarascio manages the charter sales office, Nick Tarascio serves as CEO, and Greg Tarascio leads the maintenance and avionics department. The team has grown to include some of the industry’s sharpest and most passionate management, administration, flying and maintenance talent. The company operates out of Republic Airport in Farmingdale, New York. Learn more at www.ventura.aero. Headquartered in Charlotte, North Carolina, SmartSky Networks was formed in 2011 by senior aviation and telecommunications executives seeking to transform aviation through the use of disruptive communications technologies and related tools. Working with leading aerospace and technology partners, SmartSky has begun the rollout of its innovative, air-to-ground network, SmartSky 4G LTE. The network takes advantage of patented spectrum reuse, advanced beamforming technologies and 60 MHz of spectrum for significantly enhanced connectivity. SmartSky 4G LTE delivers data to the aircraft at rates comparable with next generation satellite solutions and provides unmatched capacity for data transmissions from the aircraft to the ground. This real-time, low latency, bidirectional data link makes SmartSky 4G LTE a key enabler for the new and enhanced apps, services, and hardware that will usher in the digitization of the aviation industry. Learn more at www.smartskynetworks.com. 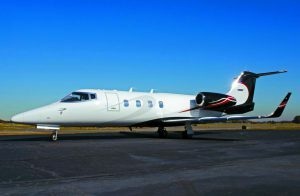 May be downloaded at https://www.gretemangroup.com/ventura-air-services-commits-to-secure-bombardier-learjet-55-stc.